You can choose a pre-designed style for the content. Use this to apply a preferred color, gradient, or image to the content background. 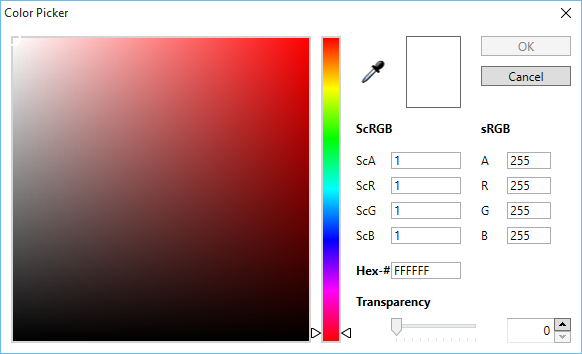 TemplateToaster provides a color picker to choose a background color. Here is the full description of it. You can create custom gradients with preferred angle, color, and offset choices. You can save the gradients as well. See this for more information about creating and saving the custom gradients. You can even apply an image to the content background. TemplateToaster presents an inbuilt stock of free images. You can select an image from the stock, or browse your custom images. You can even edit the browsed images. TemplateToaster has an image editor with a dozen of edit options to customize the browsed images. For details, see this section. Marks the border around the content and modify its properties such as Style, Thickness, Radius and Color. See this to know more. Specifies the margin of the content for all the sides i.e. top, bottom, left, and right. Specifies the top, bottom, left, and right padding of the content. To apply a texture to the content background. You can customize the transparency of texture with “More”. Click Here for more details. To give an effect to the content background. You can customize the transparency of the effect using “More”. Click Here for more details. To apply a shadow effect to the content background. To apply a preferred color, image, or gradient in the background. TemplateToaster provides pre-designed gradients and stock images. Also, you can create the custom gradients or browse your own images. Marks a border for the post which you can customize too. For customizing the border, you can have Style, Thickness, Radius (of edges), and Color options. Specifies the all side margins i.e. Top, Bottom, Left and Right. Specifies the padding from all the sides i.e. Top, Bottom, Left and Right. To apply a texture to the background of the post. You can customize the transparency of texture with “More”. Applies an effect to the background of the post. You can customize the transparency of the effect using “More”. Applies a shadow effect to the background of the post. With “More”, you can even customize the color, angle, blur, and distance of the shadow effect. Customization of the Post Title in Normal and hover states by specifying different properties . Specifies the number of post columns on a single page. To show/hide the Featured Posts. Use this to apply a preferred color, gradient, or image to the comment form background. You can create custom gradients with the preferred angle, color, and offset choices. You can save the gradients as well. See this for more information about creating and saving the custom gradients. You can even apply an image in the background. TemplateToaster presents an inbuilt stock of free images. You can select an image from the stock, or browse your custom images. You can even edit the browsed images. TemplateToaster has an image editor with a dozen of edit options to customize the browsed images. For details, see this. Marks the border around the comment form and modify its properties such as Style, Thickness, Radius and Color. See this to know more. Specifies the margin for all the sides i.e. top, bottom, left, and right. Specifies the top, bottom, left, and right padding of the comment form. To apply a shadow effect to the form background. Defines the text style of Comment form content by specifying Font Family, Font Color, Size etc. To apply a preferred color, image, or gradient in the background of the comment. TemplateToaster provides pre-designed gradients and stock images. Also, you can create custom gradients or browse your own images to apply in the background. Applies a shadow effect to the background of the Comment. Defines the text style of Comment by specifying Font Family, Font Color, Size etc. Specifies the top, bottom, left, and right padding of the comment element. Marks the border around the comment and modify its properties such as Style, Thickness, Radius and Color. See this to know more. You can show or hide the image ( also called avatar) with the comment. Aligns the image in left/ right of the comment. Customizes the image border by specifying its Thickness, Style, Radius etc.